Regardless of whether you store the user data in Active Directory or in the ixi-UMS User Management, the ixi-UMS properties of the users are entered in the user administration integrated in ixi-UMS Business. If you have selected "User management in Active Directory" in the ixi-UMS Business configuration, the users from the Active Directory are displayed and you can edit the ixi-UMS properties. You can also enter/change the numbers. If you have selected "ixi-UMS User Management", you must create all users yourself. You can edit , delete , and create an e-mail with a new password for each user. Please note: A new password is generated each time a new "password mail" is sent. The user needs the password to log on to the <% IXI-UMS%> Web Journal and the <% IXI-UMS%> Voice Mailbox Configuration. If both websites are not used, the creation of a password is not required. Generally, the user must enter the recipient numbers and the default e-mail address must be present. 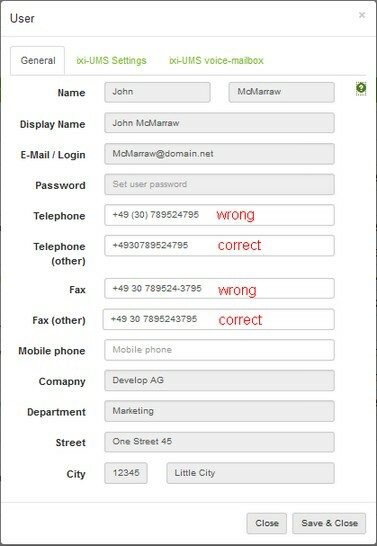 Regardless of the LDAP database used, you must enter the ixi-UMS properties for Fax/SMS and can optionally make settings for ixi-UMS Voice Mailbox. In general, you must enter the recipient number per user. - the Voice-Mailbox-Funktion "Gemeinsame Voice-Mailbox Nummer"
Here you must enter the recipient number for which the user should receive the ixi-UMS messages (fax and voice). Two receiver numbers can be assigned to each user. This is only evaluated when sending SMS messages. The prerequisite is that the SMS provider supports the function "individual senders". Basically: No () - / or other characters may be included. Users must log in to both web-based ixi-UMS pages with the e-mail address displayed here and the password entered in the LDAP database.